Louisiana (Spanish: Luisiana) was the name of an administrative district of the Viceroyalty of New Spain from 1763 to 1801 that consisted of territory west of the Mississippi River basin, plus New Orleans. Spain acquired the territory from France, which had named it La Louisiane in honor of King Louis XIV in 1682. It is sometimes known as Spanish Louisiana. The district was retroceded to France, under the terms of the Third Treaty of San Ildefonso (1800) and the Treaty of Aranjuez (1801). In 1802, King Charles IV of Spain published a royal bill on 14 October, effecting the transfer and outlining the conditions. Spain was largely a benign absentee landlord administering it from Havana, Cuba, and contracting out governing to people from many nationalities as long as they swore allegiance to Spain. During the American War of Independence, the Spanish funneled their supplies to the American revolutionists through New Orleans and the vast Louisiana territory beyond. In keeping with being absentee landlords, Spanish efforts to turn Louisiana into a Spanish colony were usually fruitless. For instance, while Spanish officially was the only language of government, the majority of the populace firmly continued to speak French. Even official business conducted at the Cabildo often lapsed into French, requiring a translator on hand. When Alejandro O'Reilly re-established Spanish rule in 1769, he issued a decree on December 7, 1769, which banned the trade of Native American slaves. Although there was no movement toward abolition of the African slave trade, Spanish rule introduced a new law called coartación, which allowed slaves to buy their freedom, and that of others. A group of maroons led by Jean Saint Malo resisted re-enslavement from their base in the swamps east of New Orleans between 1780 and 1784. On May 4, 1795, 57 slaves and 3 local white men were put on trial in Point Coupee. At the end of the trial 23 slaves were hanged, 31 slaves received a sentence of flogging and hard labor, and the three white men were deported, with two being sentenced to six years forced labor in Havana. Spanish colonial officials divided Luisiana into Upper Louisiana (Alta Luisiana) and Lower Louisiana (Baja Luisiana) at 36° 35' North, at about the latitude of New Madrid. This was a higher latitude than during the French administration, for whom Lower Louisiana was the area south of about 31° North (the current northern boundary of the state of Louisiana) or the area south of where the Arkansas River joined the Mississippi River at about 33° 46' North latitude. In 1764, French fur trading interests founded St. Louis in what was then known as the Illinois Country. The Spanish referred to St. Louis as "the city of Illinois" and governed the region from St. Louis as the "District of Illinois". To establish Spanish colonies in Louisiana, the Spanish military leader Bernardo de Gálvez, governor of Louisiana at the time, recruited groups of Spanish-speaking Canary Islanders to emigrate to North America. In 1778, several ships embarked for Louisiana with hundreds of settlers. The ships made stops in Havana and Venezuela, where half the settlers disembarked (300 Canarians remained in Venezuela). In the end, between 2,100 and 2,736 Canarians arrived in Louisiana and settled near New Orleans. They settled in Barataria and in what is today St. Bernard Parish. However, many settlers were relocated for various reasons. Barataria suffered hurricanes in 1779 and in 1780; it was abandoned and its population distributed in other areas of colonial Louisiana (although some of its settlers moved to West Florida). In 1782, a splinter group of the Canarian settlers in Saint Bernard emigrated to Valenzuela. In 1779, another ship with 500 people from Málaga (in Andalusia, Spain), arrived in Spanish Louisiana. These colonists, led by Lt. Col. Francisco Bouligny, settled in New Iberia, where they intermarried with Cajun settlers. In 1782, during the American Revolutionary War and the Anglo-Spanish War (1779–83), Bernardo de Gálvez recruited men from the Canarian settlements of Louisiana and Galveston (in Spanish Texas, where Canarians had settled since 1779) to join his forces. They participated in three major military campaigns: the Baton Rouge, the Mobile, and the Pensacola, which expelled the British from the Gulf Coast. In 1790 settlers of mixed Canarian and Mexican origin from Galveston settled in Galveztown, Louisiana, to escape the annual flash floods and prolonged droughts of this area. Beginning in the 1790s, following the slave rebellion in Saint-Domingue (now Haiti) that began in 1791, waves of refugees came to Louisiana. Over the next decade, thousands of migrants from the island landed there, including ethnic Europeans, free people of color, and African slaves, some of the latter brought in by the white elites. They greatly increased the French-speaking population in New Orleans and Louisiana, as well as the number of Africans, and the slaves reinforced African culture in the city. The French established settlements in French Louisiana beginning in the 17th century. The French began exploring the region from French Canada. 1762 – As negotiations began to end the Seven Years' War, Louis XV of France secretly proposed to his cousin Charles III of Spain that France give Louisiana to Spain in the Treaty of Fontainebleau. 1763 – The Treaty of Paris ended the war, with a provision in which France ceded all territory east of the Mississippi (including Canada) to Britain. Spain ceded Florida and land east of the Mississippi (including Baton Rouge) to Britain. 1763 – George III of the United Kingdom, in the Royal Proclamation of 1763, proclaimed that all land east of the Mississippi acquired in the war – with the exception of East Florida, West Florida and Quebec – would become an Indian Reserve. 1764 – Pierre Laclède established the Maxent and Laclède Company trading post at St. Louis. 1764 – Spain's acquisition of Louisiana from France was formally announced. 1765 – Joseph Broussard led the first group of nearly 200 Acadians to settle on Bayou Teche below present-day St. Martinville, Louisiana. 1768 – Antonio de Ulloa became the first Spanish governor of Louisiana. He did not fly the Spanish flag and was forced to leave by a pro-French mob in the Rebellion of 1768. 1769 – Alejandro O'Reilly suppressed the rebellion, executed its leaders, and sent some plotters to prison in Morro Castle in Havana. He was otherwise benign and pardoned other participants who swore allegiance to Spain. He established Spanish law and the cabildo (council) of New Orleans. 1770 – Luis de Unzaga freed the imprisoned rebels. 1780 & 1783 – The Battle of Saint Louis and the Battle of Arkansas Post were the only military engagements fought west of the Mississippi River during the American Revolutionary War. 1788 – The Great New Orleans Fire destroyed virtually all of New Orleans. Governor Esteban Rodríguez Miró was respected for his relief efforts. 1789 – Work on rebuilding New Orleans began, the city at that time being limited to what is now the French Quarter. The new structures had courtyards and masonry walls. The cornerstone for the new St. Louis Cathedral was laid. 1795 – Pinckney's Treaty settled boundary disputes with the United States and recognized its right to navigate through New Orleans. 1798 – Spain revoked the United States' right to travel through New Orleans. 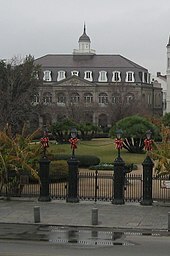 1799 – The newly-rebuilt Cabildo opened. 1800 – In the Third Treaty of San Ildefonso, Napoleon secretly acquired the territory, but Spain continued to administer it. 1801 – The United States was permitted again to use the port of New Orleans. 1803 – The Sale of Louisiana to the United States was announced. 1803 – Spain refused Lewis and Clark permission to travel up the Missouri River, since the transfer from France to the United States had not been made official; they spent the winter in Illinois at Camp Dubois. 1803 – On November 30, 1803, Spanish officials formally conveyed the colonial lands and their administration to France. 1803 – France turned over New Orleans, the historic colonial capital, to the United States on December 20, 1803. 1804 – On March 9 and 10, 1804, another ceremony, commemorated as Three Flags Day, was conducted in St. Louis to transfer ownership of Upper Louisiana from Spain to the French First Republic, and then from France to the United States. ^ a b Hall, Gwendolyn Midlo (1995). Africans in Colonial Louisiana: The Development of Afro-Creole Culture in the Eighteenth Century. Baton Rouge, Louisiana: Louisiana State University Press. ISBN 978-0807119990. ^ Kaplan-Levenson, Lanie (10 December 2015). "More Than A Runaway: Maroons In Louisiana". WWNO-FM. New Orleans, Louisiana. Retrieved 3 October 2016. ^ Reasonover, John R.; Michelle M. Haas (2005). Reasonover's Land Measures. Copano Bay Press. p. 41. ISBN 978-0-9767799-0-2. ^ Ekberg, Carl (2000). French Roots in the Illinois Country: The Mississippi Frontier in Colonial Times. Urbana and Chicago, Ill.: University of Illinois Press. pp. 32–33. ISBN 9780252069246. ^ G. Armistead, Samuel. La Tradición Hispano - Canaria en Luisiana (Hispanic Tradition - Canary in Louisiana). Pages 51 - 61. Anrart Ediciones. Ed: First Edition, March 2007. ^ a b c "St. Bernard Isleños: Louisiana's Spanish Treasure". The Los Isleños Heritage & Cultural Society Museum. Retrieved 15 October 2018. ^ Din, Gilbert C. (Spring 1976). "Lieutenant Colonel Francisco Bouligny and the Malagueño Settlement at New Iberia, 1779". Louisiana History: The Journal of the Louisiana Historical Association. 17 (2): 187–202. JSTOR 4231587. ^ Bradshaw, Jim (27 January 1998). "Broussard named for early settler Valsin Broussard". Lafayette Daily Advertiser. Archived from the original on 21 May 2009.